So, today I've been working on my reinterpretation of 'War and Peace (1951)' by Picasso. I've been really enjoying it, it's good to have a project on the go again. The more I work on it the more I'm convinced that we picked a good piece to interpret: it has clear themes that can be interpreted in lots of different ways. It also has the feel of a sketch, a rough before a final piece; which suits this project perfectly- it's like we've been given an empty box of Quality Street and it's up to us to fill it with chocolates (hope that makes sense). 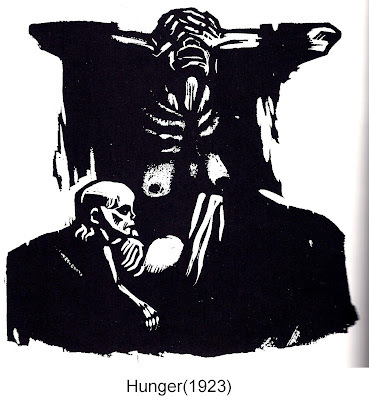 Anyway, I've been getting really into woodcuts over the past few months; particularly German Expressionist Woodcuts. 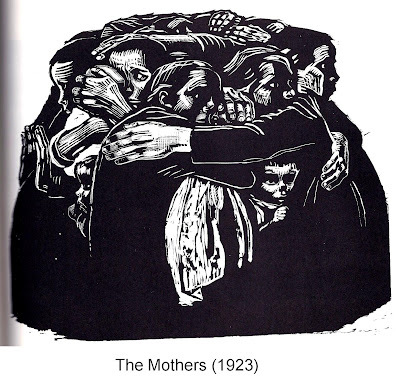 Kathe Kollwitz is an artist that I really admire, I think she makes perfect use of the medium; using the blocks of solid black ink as darkness, and the the elements that she carves away as the light poking through. 'Darkness' is certainly the word to use when describing her work, it is incredibly disturbing and distressing. I find that her work is the kind that divides people; some people get it and really like it; some people find it too austere and depressing. Which is understandable, these pieces are about as dark as art can get; it's as if Kollwitz is testing us, to see how much we can take. How far do we dare stare into the abyss? To me though, these pieces are as beautiful as they are bleak; there is a truth and a sincerity to them which I think is always to be admired. Hello Matt, my name is Irene. 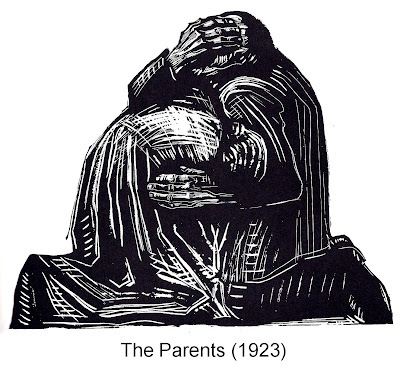 I am doing a paper on censorship, then and now, and have chosen Ai Weiwei and Kathe Kollwitz as my artists to compare and contrast. I have to agree with your statement above that Kollwitz is dark, but, she captures 'despair' so convincingly that it is hard not to see her art as anything but art at its most poignant moment. I hesitate to say that her work is beautiful because a teacher once lashed out at me about calling art beautiful saying: "is that all it is, is pretty? Yet, I do believe that art can be beautiful and I do believe that the work by Kollwitz is beautiful because of the way she is able to render an emotional state of being. Thank you for posting her work!